Balanced Obedience / Force-Training Dummy. $9.95. "You will see most dogs actually reaching for the dummy, which makes the transition to fetch easier." The force fetch dummy is a really great tool to start the command hold, with and after several days. You will see most dogs actually reaching for the dummy, which makes the transition to fetch easier, and this really teaches a proper way to hold numbers and birds. "Easy transition to the ground and encourages a nice hold." Easy transition to the ground and encourages a nice hold. "This was a great help with the progress of my young dog with the force fetch training." This was a great help with the progress of my young dog with the force fetch training. He was quick to pick it up and hold it. He liked it better that any other bumper. "Hard center helps with dog wanting to chew." Hard center helps with dog wanting to chew. "Nice product for the trained retrieve." Vizslas & WPG. Hunts. Competes. Nice product for the trained retrieve. Shipped fast, but took a week to arrive through USPS. "Came as described. Very pleased!" Came as described. Very pleased! I love this. I tried many other object to try to get my dog to 'take it' and 'hold it'. This worked perfectly!!! "Great for practice in AKC Obedience and Hunt training competition." Great for practice in AKC Obedience and Hunt training competition. Great tool for trained retrieve. Nicely made product. Would like it better a little larger in diameter. Good quality training buck. Picked this one because Rick used it on his Fowl Dawgs DVD. Only problem is that my dog has a tendency to want to mouth it a lot. However my dog was 2 years old when I force fetched him. I have since used it on younger pups with great success and no mouthing problems. "This is something that I am using to have my 15 month old get used to holding and retrieve." This is something that I am using to have my 15 month old get used to holding and retrieve. 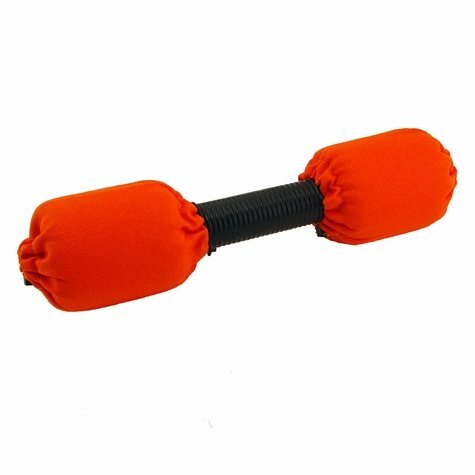 It would have been nicer to have the outside orange ends be thicker, so it is easier to pick up off the ground, and it is not as tempting to grab and use as a tug toy with my other dogs. It was a good buy for the price! "I know it's designed for force training and not meant as a retrieving bumper, but neither me nor my dog like the hard plastic center." I know it's designed for force training and not meant as a retrieving bumper, but neither me nor my dog like the hard plastic center. He tends to retrieve it from the softer ends when after a force training lesson. I like to throw it a few times to reward his efforts. Looking for one with a nylon rope center area. Good for teaching "hold" and for force training. The raised center bar makes it easy for a dog to pick up from table or ground. Orange with black plastic center bar. 2" x 10".